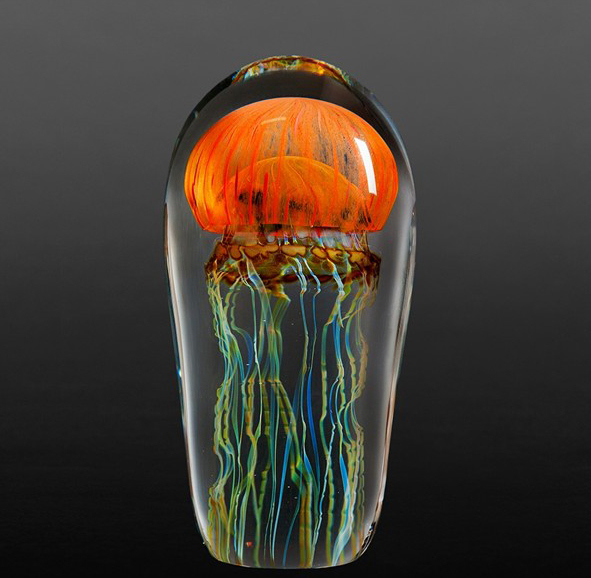 Sculpture size: 4.5" X 2.5"
Sculpture size: 5.5" X 3"
Sculpture size: 5.75" X 3"
Sculpture size: 6" X 3"
Sculpture size: 6.25" X 3"
Sculpture size: 6.5" X 3"
This particular jellyfish sculpture has a beautiful orange ribbed dome. Under the dome is a brown and gold band with an array of white tendrils surrounded by thin and wispy colorful tendrils. Each original handmade sculpture is a one of a kind piece. No two sculptures are alike.